The article entitled “The Strangest Numbers in String Theory” is about an early observation from the study of superstring theories that the four division algebras are related to four classical formulations of superstring theory in 3, 4, 6 and 10 dimensions. The four division algebras are the reals, complex numbers, quaternions and octonions with dimensions 1,2,4 and 8 and the dimensions of the superstring theories are 2 dimensions higher in each case. Many of our readers will be familiar with the internet writings of John Baez where he has described these things so I wont attempt to cover any details. His student John Huerta has just finished off his thesis in which he clarifies these observations using higher dimensional lie algebras. The results extend to one dimension higher when strings are replaced by membranes. In the quantum theory only the highest dimensional versions related to the octonions hold up consistently giving us the 10 dimensional superstring theories and M-theory in 11 dimensions. Of course this is not complete since we still don’t know what the full formulation for M-theory is. Even these higher dimensional observations are not new, see for example Mike Duffs brane-scan from 1987 where the relationships were already plotted out. This new work clarifies these results using the concept of 3-lie-algebras from n-category theory. The Scientific American version does not go into great detail but is a very well written introduction to the ideas. If you don’t have access to it don’t worry, John says he will be allowed to post an online version after a month or so. You can also explore what has been posted already starting here which is more advanced than the article but still very pedagogical. Personally I find these algebraic ideas for M-theory very enticing. It is a major goal to formulate a complete non-perturbative version of string theory that encompasses all its forms and I think the purely algebraic approach is the best line of attack. It is especially intriguing that the octonions have such a direct relationship to the dimensions in which these theories work, but ultimately the algebraic structures we need to understand it fully are probably much more complex. The work of Mike Duff and his collaborators which brings in the algebra of hyperdeterminants and qubits to understand a slightly different role of the octonions in string theory is one of the areas to follow. This work brings in the duality algebras found in string theory black holes. I know that several of our regular commenters are very familiar with this already so I need not give more details. Indeed it is the fact that the same algebraic structures keep appearing in different contexts that is so intriguing, yet so confusing, as if we are missing some principle of unification that relates these things. Last night the Large Hadron Collider clocked up another record luminosity using 624 bunches per beam. In ATLAS the peak luminosity was measured at 737/μb/s while CMS saw about 10% less at 660/μb/s. In theory they should be seeing about the same amount. Paul Collier (head of the beams department at CERN) has said that they suspect the ATLAS figure is too high. A more accurate measurement will be made after the next technical stop in two weeks time when a Van der Meer scan will be run through. Meanwhile I will quote the lower CMS numbers and will be updating the figure in the viXra Log banner above. 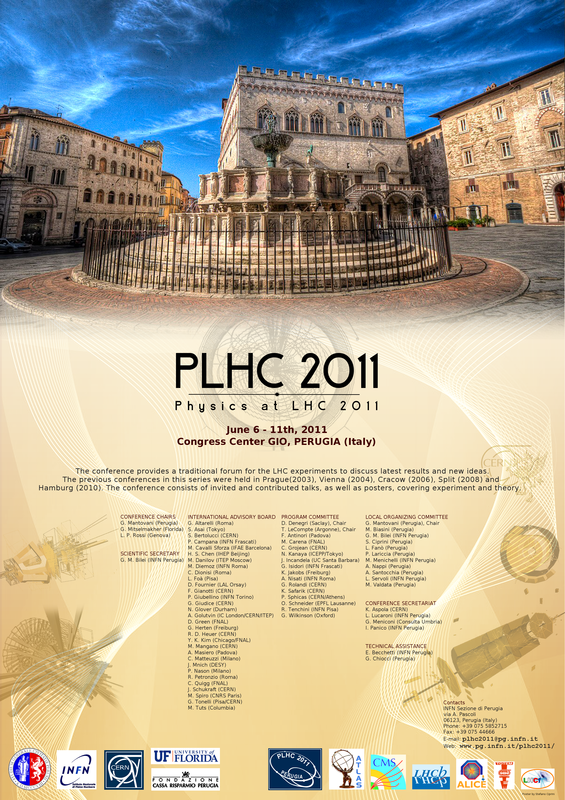 An important date coming up in the LHC calendar is the 6th June when the “Physics at LHC 2011” conference starts. The experiment teams will be keen to show results using as much data as possible collected before that date. That will be challenging given the rate at which data will then be accumulating and the need to get about 3000 physicists in each collaboration to sign off on any results before they are presented. A few weeks ago I said the LHC should be able to deliver 200/pb before the conference. In fact they have already surpassed that figure for 2011 and can add last years 40/pb as well to make nearly 240/pb. I will also be tracking this number above. Two weeks ago I upped the estimate to 500/pb for the conference but even that is looking a little unambitious now. According to the plan there are about 30 days left for physics before the 6th June and they can now easily collect about 30/pb each day. My new estimate is at least 1000/pb which is 1/fb in time for the conference assuming they don’t lose too many days to machine development or faults. Recall that 1/fb is the official target for the whole of 2011! It may sound like their original expectations were a bit low but really this amazing result is due to the exceptional early performance of the collider when compared with previous models. The 6th June also marks the point when commissioning of the LHC for this year should officially stop. If all goes well they will be aiming to reach this years maximum luminosity by this date. Which will mean filling with 1404 bunches per beam to provide something like 70/pb per day. 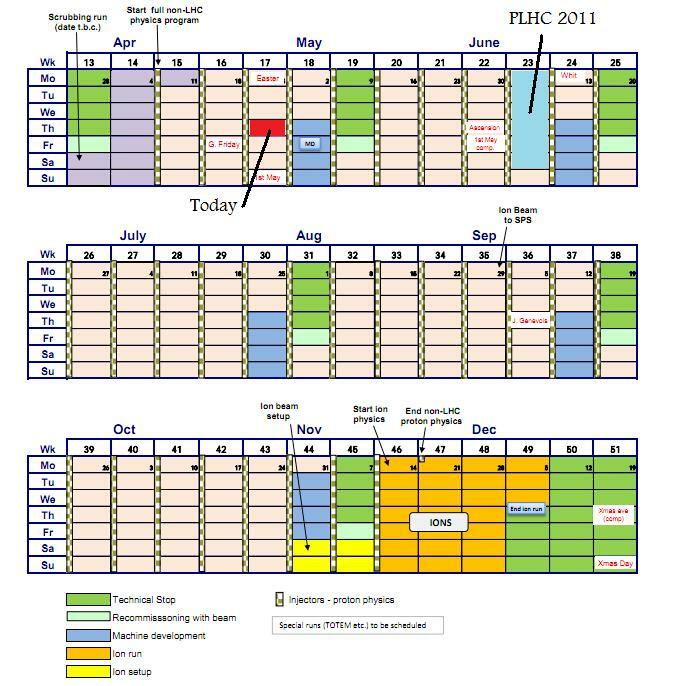 From 6th June there are 124 days marked on the plan for running proton physics. Do the sums and you will get my new estimate for this years total of 10/fb, easily enough to find the Higgs boson whatever mass it has, or rule it out. The Main Stream Media have increasing trouble reporting science news because journalists are rarely sufficiently expert in specialized fields and just make mistakes. Newsy.com (who is not really MSM), has found the solution. Just quote lots of snippets from science blogs and with next to no effort they have an incredibly well balanced report! Until yesterday the highest luminosity measured in a hadron collider was 402.4/μb/s achieved at the Tevatron last year. Last night the Large Hadron Collider smashed this record with a luminosity of 481/μb/s using a 480 bunch filling scheme. This takes them nearly half way to this years target of 1/nb/s . In fact they are likely to reach that level in the next few weeks and can go well beyond if they stick to the 50ns bunch spacing. Update 23-Apr-2011: The latest run collected a record 15/pb taking this year’s total to over 100/pb. Until at least Monday they plan to stay with 480 bunches. At this level they should collect 20/pb per day. With about 150 days of proton physics left this year that would already provide 3/fb. However it will probably not be long before they continue to push up the luminosity. Another factor of four should be possible if they can go all the way to 1404 bunches and use nominal intensities. There is a new rumour about a new particle doing the rounds of the physics blogs. So far it is reported at Not Even Wrong, Resonaances and The Reference Frame. I do not claim to be the best source of details about new phenomenology,but sometimes my intuition is good so here are a few points. This is not a hoax. It was revealed in an internal memo that was apparently more pubic than it should have been. This is where SUSY prefers the Higgs, but said Higgs does not give such a high rate of diphoton decays. As seen recently bumps can be made to disappear by adjusting the analysis, and this analysis is not completed and approved so it could go away. However, the signal seems to be consistent with the old LEP observation and with faint hints in Tevatron results, so this suggests something real. If it is real then CMS must see it too. Therefore Tommaso Dorigo must remain silent. Although the old LEP result was always considered a hint of a Higgs and this seems likely to be the same thing, we should be open-minded about what it really is. On the one hand I want it to be SUSY and this is possible. We expect to hear about variants of SUSY that fit the bill at the next arXiv hep-ph update. On the other hand, a high photon coupling suggests a neutral composite particle made of charged constituents, like a meson. I don’t know if this is plausible but someone will be suggesting such possibilities soon. Whatever it is, if it is real it is almost certainly Beyond Standard Model and therefore very exciting. The data collected by ATLAS is already quite a bit more than the amount used in this analysis and it will increase by a factor in the coming weeks. There will be more news soon. The Large Hadron Collider today returned to physics runs. Over the last few days they had been filling the collider for scrubbing runs in an effort to remove the e-cloud problem. In fact they only did a few hours of scrubbing runs before surprisingly returning to physics with 50ns bunch spacing. On the face of it this is great news because it suggests that they have concluded that the problems are not too severe and physics with 50ns spacing will be the norm for this year. However I have heard no official word so I can’t confirm that they wont change back to 75ns spacing. With the 50ns spacing they will be able to get 1400 bunches into the collider. This is half the design limit of the machine which may only be achievable when they move to the higher energy of 14 TeV in 2014. During the scrubbing runs they were already able to circulate 1020 bunches, so perhaps it will not be long before they reach similar numbers with colliding beams. It is very impressive that they have reached this point so quickly. For today they have been running with 228 bunches providing a luminosity of 250/ub/s just below the records of a few weeks ago. They need three runs and 20 hours of stable beams before they can go to the next step at about 300 bunches. Just one more runs of about 5 hours should do it. Today’s runs have already added about 10/pb to the total integrated luminosity delivered to each of ATLAS and CMS. Update 16-Apr-2011: The next step is set as 336 bunches and still with 50ns spacing. Expected peak luminosity is about 360/ub/s which will be a new record, fingers crossed. Total luminosity delivered for 2011 has passed the 40/pb delivered in 2010. Update 17-Apr-2011: After a few false starts a good long run with 336 bunches is now in progress. It started with a peak luminosity of 380/ub/s in ATLAS and 360/ub/s for CMS. After 9 hours the integrated luminosity has passed 10/pb, the highest yet for a single run. This may be a good moment to speculate about how much data they can collect before the “Physics at LHC” conference to be held in Italy from 6-11 June. The answer depends on many things but I don’t think 0.5/fb is overly optimistic at this stage assuming they proceed with continuous physics runs and increasing luminosity according to the plan which has six weeks of running before the conference. 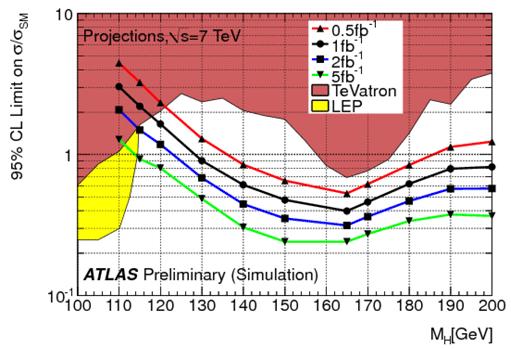 To give some meaning to that amount of data here is the expected Higgs limits for ATLAS. 0.5/fb would exclude the Higgs between 140GeV and 180GeV, unless it is there. Of course even if they do collect 0.5/fb before the conference they would have to do the analysis very quickly to be able to report it in time and I don’t expect that to be possible. Other results are more likely to be shown and the Higgs limit should just be taken as an indication of how much progress has been made when these landmarks are reached. Spring is very much in the air here in Europe with warm temperatures and sunny skies over most areas. As many of us spring clean our homes the Large Hadron Collider is also undergoing a thorough scrubbing of its pipes to make it ready for it’s first full scale physics runs. For the collider this does not involve teams of cleaning ladies with dusters and scrubbing brushes. The pipes are scoured clean by sending high intensity beams through the pipes for a period of several days. The collider was stopped for more than a day while they checked all similar connections to ensure that no further faults were still present. The scrubbing runs have now restarted. These runs were planned at the end of last year after they first reached high intensity with the proton beam runs. They noticed excess background events in the ATLAS detector which were found to be caused by a build-up of an electron cloud in the pipes where the beams approached the detectors. The electrons are released from residual gas molecules in the walls of the pipes. These electrons then strike back on the surface releasing a cascade of further electrons. The circulating proton beams collide with the electrons sending particles towards the detectors that have to be filtered out of the analysis. Too much background of this sort can hide the signals they are looking for. One step taken to resolve the problem is the installation of solenoids that produce electric fields around the affected areas steering the electrons away from the pipe to avoid the cascades. But in a addition they scheduled these scrubbing runs in which high intensity proton beams are circulated at 450 GeV to tare the residual gas molecules out from the walls of the pipes. They can then be pumped out using the vacuum systems. The process will last about a week and could see as many as 1200 bunches being circulated. The protons will not be ramped up to the full energy of 3.5 TeV at which collisions have been made but the runs will also allow the operators to see how well the injection systems work to produce the beam intensities that could be used in physics runs later this year. The extent to which these scrubbing runs are successful will determine how much collision data can be collected this year. If they manage to remove most of the electron clouds they will progress to running with the 50ns bunch spacing that will make it possible to inject up to 1400 bunches for the physics runs. Otherwise they will stick with the 75ns spacing currently in use for physics but that would limit the number of bunches to about 900 and will mean correspondingly lower luminosities for the runs this year. update 11-apr-2011: For the scrubbing runs they have injected 1020 bunches per beam. This is near to the maximum intensities that they can get to with 50ns spacing. Although they are not ramping up to 3.5 TeV or colliding particles at this time it is good to see that this step can already be done successfully. You are currently browsing the viXra log blog archives for April, 2011.